Khuếch đại nhánh Oudoor : We are professional manufacture in CATV line in China, we offer CATV splitter, CATV amplifier, CATV optical receiver, CATV optical transmitter, CATV optical optical switch, EDFA and so on. Design for bi-directional network behind optical receiver. High gain and output imported module, more economical and applied. Perfect bi-directional structure brings installation and debugging convenient. 2. Equalizer, attenuator have fixed and adjustable structure for selection. 3. Output splitter or coupler can plug change to make engineering debug more agile. 4. Forward and reverse fore-and-aft have independent test port, easy to debug. 5. Return channel adopt Philips or Motorola amplify module, good quality duplex filter, plug fixed attenuators and equalizers, makes it high C/N, easy to debug. 6. High reliable switch power and strict anti-thunder system fit for safe steady work in worse weather. 7. 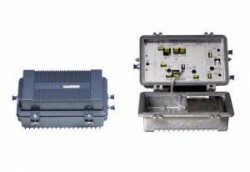 Suitable large or middle-size bi-directional network main trunk signal transmission, can substitute imported and famous brand machine.